Spoilers: Grotesque, vague reference to the series finale, which I’ve never seen so don’t know the name of and don’t care to. Summary: Precious and fragile things need special handling. Disclaimer: X-Files and all characters within belong to Fox and 10-13 productions. 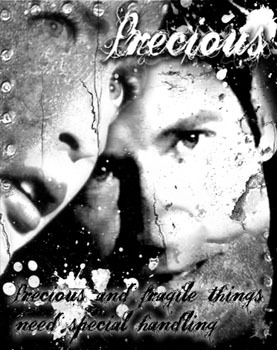 The song ‘Precious’ referenced within is the property of Depeche Mode and their related companies. She don’t know why she stopped that day. She could have easily driven past just like all the other drivers who slowly gawked at the fluttering yellow tape and the men milling about in dark trench coats. She normally shied away from anything that might remind her of the life she’d left behind more than a year and a half ago – which usually wasn’t too hard since she lived in an area with a low crime rate and her patients were all alive when she saw them. If, on the off chance, she saw an ambulance by the side of the road or flashing red and blue lights signaling criminal activity, she didn’t stop and offer assistance. The paramedics were well trained and the police could handle most of the curve-balls thrown their way. They didn’t need an ex-FBI Agent who was now a family practitioner poking her nose in where it didn’t belong. She liked her life now. It was safe. Normal. Two words she never thought would apply to her. She had a job she enjoyed, keeping the families of her small neighborhood healthy; never dealing with anything worse than cuts from yard work or the occasional broken bone when one of the kids fell out of a tree. Expecting mothers were a breath of fresh air, the complete opposite of the death and decay she used to deal with, searching for the terrible reasons the empty shells had come to her. Her career was on track, her practice steadily growing as her clients spread the word of her skill and bedside manner, and her home life was just as satisfying. She shared a house in a small community close to her office with her fiancé Mark. They met about ten months ago at the most inane of places – the coffee shop. They had both gotten caramel frappuchinos and while waiting for their drinks to be prepared they got to talking. Talking led to dating and dating led to cohabitation. Their relationship moved along quicker than she had ever imagined but they fit together so smoothly and there had been no bumps in the road. Mark was an accountant, working for a law firm downtown that dealt with pro-bono cases. Sandy hair, blue eyes, and a compact frame that spoke of strength met her every day when she came home, his arms embracing her and his lips promising a lifetime of love. She went through the mail, cooked dinner – or ate whatever Mark’s concocted – and they fell asleep watching a movie. It was so blissfully normal. She was on her way home from a medical conference in the city, the traffic crawling along on the interstate as people rubbernecked at what she assumed was an accident. She had already called Mark and let him know she was going to be late and to go ahead and eat dinner without her. Then she sat back in her seat and settled in for a long wait, flipping through the radio stations for a traffic report. It wasn’t too hard to find, since most of the stations had fifteen minute updates at that time of day. She tuned out after that, a strange feeling gnawing at her gut that she tried to ignore. Perhaps it had something to do with her background and that the FBI had been involved in the accident up ahead. Or maybe it was the disturbing thought of the serial killer case, known as the White Crown Killer to the public, and that the man’s reign of terror might have been brought to an end. The killer had been breaking in to houses in the upscale White Crown District and setting up intricate chambers of torture with the victim’s own belongings. The news didn’t give the gory details but Dana could guess at some of the depravities the killer had committed. Household chemicals and everyday tools from the kitchen or garage could inflict more harm than the average person might imagine. Needless to say, the wealthy people who lived in the District had raised an uproar and she had no doubt that whatever poor SAC was in charge of the case was constantly barraged by the high ups to solve the case. Idly she wondered if it was an important enough case to merit Mulder’s attention. She shook her head in dismay, striving to dislodge the direction her thoughts were taking. She had tried so very hard to avoid any stray thoughts about her ex-partner. Every time she did, a cold vice gripped her heart and twisted cruelly until it moved down to her belly and settled like a lead weight. Was it guilt? Sadness? Emptiness? They were all possibilities but she refused to chose which, focusing instead on the idea that whatever it was, it was a pointless feeling. After all, it hadn’t been her fault. They had run from the government, becoming fugitives sought by those they used to work for and with. Mulder wanted for murder, her as an accessory. They had moved from place to place, living in cheap motels and abandoned houses or sheltering with one of Mulder’s contacts from the files the Lone Gunmen had left him. It wasn’t a life she’d ever dreamed of for herself but she was oddly happy. Yes, they were constantly looking over their shoulders, never able to stay in one place for long, hunted like criminals. But they were together. They had grown closer, finding comfort in each other’s arms and letting down all the barriers that had once been so important between them. Physical intimacy became as natural as breathing but it still came as a surprise when she found out she was with child. The six months that followed were like an emotional roller coaster, elation at the thought of having a baby again, fear that the shadow government would find them and take the child away, doubt about whether or not the baby would be healthy or normal. In the end it didn’t matter. She’d miscarried in her third trimester, ending up in the hospital for over a week. Mulder had been a pillar of strength throughout the whole ordeal, never once allowing anything but confidence and optimism about the baby to show. But when she lost the baby it was as if a dark veil had passed over his soul. He never left her side the entire time she was in the hospital, his hands fluctuating between clutching hers and wringing his own, murmuring reassurances to her and barking at the hospital staff as if it would help. Having already reconciled herself to a childless life once before, the loss wasn’t as traumatic to her as it was to the would-be father. It wasn’t until she woke in the middle of the night to find him sobbing in his sleep, slumped over her bed with his head on his crossed arms, that she realized he had been far more concerned about her than the baby. The depth of his love for her was almost overwhelming but she had always known he had such a great capacity for emotions, his empathy serving him well as an FBI agent but costing him far too much with the inevitable guilt of failing a victim. It was what had made him such an excellent profiler yet it was also the reason that he couldn’t handle the constant immersion in violent darkness. Which is why she never could have imagined what he did next. He’d turned himself in. Walked right in to the J. Edgar Hoover building and straight in to SAC Walsh’s office. Walsh, who’d been the ‘lucky’ one assigned to bring in the ‘renegade agents’, had been too shocked to call security. Which was when Mulder offered him a deal. Drop the charges and he would go back to profiling. It seemed like an outrageous trade to her, letting murder suspects off the hook so one of them could catch other murderers. Scully had underestimated the political ramifications of such a deal. Mulder’s talents had garnered the FBI numerous accolades during his stint in the VCS, a light of glory and goodwill shining down on the department, the SACs and ADs involved, the Bureau as a whole, and even other higher-ups in Washington. That kind of good PR was desperately needed at the moment and Mulder’s offer held enough promise that Walsh took him up on it - on one condition. She was not allowed to re-enter the FBI with him. She wasn’t sure if this was a punishment directed at him or whether the AD thought her presence would hinder Mulder’s profiling process. Most likely a combination of both. When he’d returned to tell her what he’d done she had first reacted with shock. Then fear. Then anger. Extreme anger that he would do this without consulting her, would take such a risk without even asking how she felt about it. At the time her mind raged at him for such an act, for going behind her back and essentially making a deal with the devil that affected both of them. She said things she regretted but could not rescind and they parted ways disagreeably. She thought he would realize his error, return with an apology on his lips, and they would think of a way to be together. The months passed and she finally accepted that he had moved out of her life for good and she decided to move on with hers. Over eighteen months and a part of her still couldn’t completely let go of the past. She often stayed up late, after Mark had gone to sleep, and watched the news networks for any information on the Bureau. She felt guilty, as though she were somehow betraying her relationship with Mark, but every time she caught some blurb about Mulder she couldn’t help herself. He was on the news far more than she had imagined he would be, paraded out in front of the cameras to prove that the FBI was doing their utmost to solve whatever horrific case the media was shouting about loudest. He had become the ‘Golden Boy’ again, flown around the country to consult on the biggest and most important cases, the go-to guy whenever the other law enforcement agencies came up empty. Hell, he was practically a celebrity among the press. Every time his image flashed up on the screen she couldn’t stop herself from leaning forward and studying his features. He looked all right. Not happy but not like he’d gone off the deep end either. And so she told herself that things had turned out for the best. So why did she stop that day? Her mass of cars finally began to edge past the crime scene and the promise of clear roads lay ahead, but she didn’t follow the rest of the drivers as they sped up. Instead she pulled between the flares set up to divert traffic and parked behind a black and white. The officers on scene were too busy to notice her until she had made her way to the main site of the crime. There were three cop cars total and about a hundred feet from them was a blue pick up truck with a crushed left bumper and shredded tires. She could see two bodies lying beside the wreck, one she assumed was the suspect. The other was surrounded by several men in suits, obviously Feds, who were trying to help their injured comrade on the ground. Even from this distance she could see blood pooling across the asphalt. “I’m sorry ma’am but I’m going to have to ask you to get back in your car and move on.” A uniformed officer at the edge of the scene stepped in front of her and waved in the direction of her vehicle, his expression one of obvious disgust at what he must have assumed was a lookie-loo searching for a closer glimpse of the morbid. “I’m a doctor, I thought you might need some help.” She stood confidently, matching his glare with one of her own, old habits resurfacing as she confronted the disgruntled cop. Scully felt a rush of relief when she recognized Sean Hamilton, an agent from Violent Crimes who had been friendly enough during the Patterson fiasco. “She’s okay, let her through.” The cop stepped aside and Dana swept past him to join Hamilton next to the squad cars. “What are you doing here, Agent- I mean Dr. Scully?” He kept glancing over his shoulder at the cluster of agents by the downed men. Hamilton jerked his head to look at her, his face a mixture of fear, anger, and confusion. His reaction caused a cold weight to settle in her stomach and her breath caught in her throat. Suddenly the nervous glances he had been casting behind him took on another meaning. Mulder was safe in some office, surrounded by scribbled notes, old coffee cups, and bad lighting. Wasn’t he? Fate was not that kind. The pair had reached the other agents and Hamilton asked them to make room. They stepped back to reveal a lanky man sprawled on the pavement, his shirt torn open to expose a gaping hole in his chest where a bullet at close rage had ripped through him. The assailant was laying almost perpendicular to the injured man but Scully didn’t spare him a thought, knowing that the perp was already dead; her eyes were locked onto the victim, his painfully familiar features wavering in and out as her vision suddenly blurred. A rushing sound filled her ears as she lowered himself beside him, her pressed pants soaking up the warm blood spilling down the side of his chest. Then everything became crystal clear at once and her senses focused to an almost hypersensitive state. She could hear his labored breathing rattle deep within his lungs, the slurping of torn flesh and muscle, the splash of blood as it dripped to the asphalt. She even believed she could hear the slow throb of his heart as it fought to keep enough fluid pumping through his system. “Oh, Mulder,” she breathed in a stilted whisper. Dark circles stood out starkly from his pale skin, a thin stubble graced his hollow cheeks, and his ribs were pushing against the taut skin of his abdomen. From the advanced state of his decline she could tell that his condition wasn’t recent, but achieved over a long period of time. Apparently the camera hid more that she knew or perhaps he had been put through ‘make-up’ before going on the air. It wouldn’t surprise her in the least if AD Walsh, who had been made the head of the VCS, had been behind the deception. The agents on the scene had tried to stop the flow of blood gushing from the wound with gauze from an emergency first-aid purloined from a squad car but it was already soaked through. It was obvious that the bullet had punctured a lung by the sucking sound coming from the site of the injury as well as the pink froth forming on Mulder’s slightly parted lips. Dana looked up at Sean Hamilton, who was kneeling across from her with a sympathetic look in his eyes. “He needs a hospital, now.” It came out much less forcefully than she had intended, less a command and more of a plea. “Then get me all the med kits you can find.” She returned her attention to her ex-partner, her hand automatically reaching up to brush away a few stray locks of hair from his forehead. Whether it was her voice or her touch that he responded to she didn’t know, but his eyes flickered open and gazed blearily around. The moment he recognized her was marked by a sudden intake of breath that turned into a gurgling cough. “Scully,” he managed to sputter around the bubbles of blood. Dana’s throat closed up at the hope and pain mingled in his tone and she couldn’t speak for a moment. Instead she took his right hand with her own and continued to stroke his forehead. Her brows furrowed and she found her voice. “Don’t what, Mulder?” She leaned down so he didn’t have to strain himself to speak. “Leave,” was the labored reply, his gaze still avoiding hers. “I won’t leave, Mulder, I promise,” she assured him. Agent Hamilton returned with two more first-aid kits and looked in askance if she needed anything else. She shook her head and he moved off to where the others had gathered at a respectful distance. She withdrew her hand from his and began to do what she could with her limited supplies. “Doesn’t matter.” It sounded like defeat, resignation, and almost had the cast of a mantra repeated during long lonely nights. She gave him a grim smile in thanks and turned back to her partner. Ex-partner, she meant. There was little left for her to do except make him as comfortable as possible until help arrived. When she saw the look on his face she almost gasped in horror. There was such desolation there, mingled with acceptance. That’s when it hit her - he *wanted* to die. She took a deep breath to calm the panic that was threatening just below the surface. How had he come this? Had profiling driven him this far over the edge that he was borderline suicidal? Deep inside she knew that wasn’t the answer. She had done this to him. She had broken the most precious and yet most fragile thing between them the day she had walked away - his trust. Since the beginning she’d known Mulder was cautious with his emotion, especially his trust and that it would take some special handling to keep the bond that grew between them. Occasionally it would get damaged but they were always able to repair things, managing their relationship with unspoken words. But her last words of anger and accusation had left them both brittle and removing herself from his life had shattered what little there was left. Shame washed over her in waves as she stared into the black depths of his eyes and knew that his emotional pain outweighed the physical. At that moment she wished more than anything that she could take that pain from him. She didn’t know what to say, if it was possible that any kind of apology could make amends. Instead she hid behind the safety of her medical training. He didn’t say anything, just made a motion that looked something like a shrug. She wedged an arm behind his shoulders and pulled, the sharp cry next to her ear almost making her lose her nerve. With nothing appropriate to use as padding beneath him, she scooted her body around and slipped behind him, so that she was lodged between Mulder and the suspect’s truck. Then she wrapped her arms around him to keep him upright as well as to keep pressure on the wound. He had pushed her away because, despite his claim of selfish motivations, he indeed felt she would be safer and so he would never have to go through the pain of almost losing her again. To the authorities, to a disease, to any of the myriad dangers they faced on the run. He’d sold his soul for her and she had blamed him for thinking only of himself at the time. Without hesitation, Dana murmured, “Are. I need you to get through this Mulder, I need you to help me fix what is most precious to us both.” As an afterthought Mark crossed her mind but she knew her words were the truth and Mark was an understanding man. Red and blue lights in the distance heralded the arrival of the ambulance and everyone on the scene jumped into motion. The paramedics loaded Mulder onto a gurney then onto the bus, tubes flying as they attached him to IV bags of fluids, plasma, and such. The trip would back to the hospital would take another half hour and the medics were worried about their patient’s stability. But Scully insisted he’d be okay as she climbed aboard the vehicle and seated herself next to her partner. She wouldn’t let go this time.